Housing is disrupting “progressive” politics. Specifically, it is exposing traditional “progressive” politicians for maintaining elitist and exclusionary zoning policies. Many of these “progressives” support pro-mansion land use policies that ban apartments, while it is increasingly so-called “moderates“ pushing for legalizing apartments and more inclusive zoning. The old labels fail us in the new housing world. And as progressives rally around a Green New Deal that will inevitably promote infill housing, redefining local, state and national political labels becomes essential. In California, Governor Gavin Newsom won acclaim from housing advocates and the media last week by announcing plans to build more housing to increase affordability. Newsom set an oversized goal of 3,500,000 new homes during his campaign and recently said he will at least quadruple the state’s annual housing production. Newsom believes that increasing housing supply expands affordability. He is so committed to getting housing built that he threatened to subtract transit dollars from cities that do not meet state housing goals. He has also expressed support for the direction of the Nancy Skinner-Scott Wiener led SB 50 to increase density on and near transit corridors. Progressive support for Newsom’s agenda was less vocal in San Francisco, where believing new housing increases affordability exiles politicians from the progressive island. Two days before Newsom’s budget speech the “progressive” Board of Supervisors elected Norman Yee as President. Yee has publicly opposed any homeless services in his district and helped kill affordable senior housing; neither stance proved disqualifying. Yee defeated Hillary Ronen, whose wide ranging public listing of priorities before the vote excluded any mention of legalizing apartments in the majority of the city where they are now banned. When defending exclusionary and elitist zoning and favoring new mansions over apartments identifies you with “progressives,” the term has lost all meaning. Defining opposition to new apartments as “progressive” gives moral cover to an elitist, exclusionary and often racist agenda. This misrepresentation of political labels is not just in San Francisco. Austin, Berkeley, Boulder and Portland are also filled with self-defined “progressive” politicians backing pro-exclusionary zoning policies. But recent election results show the public is no longer fooled. Austin’s City Council now has a strong pro-housing majority and Berkeley’s Council has gained a narrow pro-housing edge. 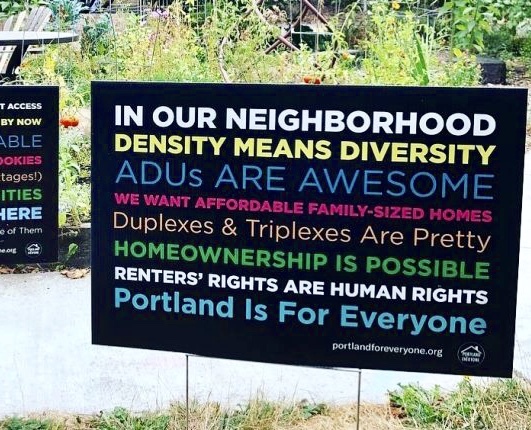 Portland homeowner groups’ faux progressivism of is not likely to stall this summer’s passage of the city’s Residential Infill Project. As “progressive” comes to require support for increased density locally, the same is happening nationally. The notion that zoning interferes with necessary housing construction is the opposite of music to the ears of many progressives. Yet Warren is among the most progressive senators and the bill is strongly supported by the nation’s leading affordable housing advocacy group, the National Low Income Housing Coalition. It will be interesting to see how many “progressives” in Berkeley, Boulder or San Francisco (to name just three cities) embrace a bill that challenges single-family home zoning. That Warren, Cory Booker and Kamala Harris are floating plans to increase federal spending on affordable housing as a prelude to presidential runs is an historic breakthrough. No Democratic presidential candidate in memory has made increased federal housing spending a noticeable part of their campaign. The housing crisis is now a middle-class issue, and solving it requires policy prescriptions— building more apartments and ending exclusionary zoning—that many traditional “progressives” oppose. Housing policy will be most disruptive in political labeling when it comes to support for the Green New Deal. Sparked by Congress member Alexandria Ocasio-Cortez, the Green New Deal has quickly become the centerpiece of national progressive activism. And while specific components are not final, you cannot have a Green New Deal without addressing the long car commutes that cause greenhouse gas emissions and worsen climate change. Curtailing car commutes requires housing policies that encourage infill housing. So long as you have 120,000 people commuting from Sacramento to the Bay Area because they are priced out of housing near their jobs—or even more commuting into Los Angeles— efforts to meet climate change goals are doomed to fail. Creating housing incentives to reduce long car commutes must be part of the Green New Deal (see “Green New Deal Requires Green Zoning”). A Green New Deal that promotes infill housing will force a reckoning for those eager to retain a “progressive” political identity while opposing new apartments in urban neighborhoods. These “progressives” have no policy prescription for cities to meet population and job growth other than “build 100% affordable housing”—an essential strategy for those who qualify but which does not address the housing needs of those who earn too much to be eligible, a group that includes teachers, nurses, and others in the working and middle-class. And that’s the crux of the dilemma for this outdated brand of “progressive”: they have no housing strategy to meet rising population and job growth. Just saying no to market rate housing neither slows gentrification nor addresses climate change—all it does it make existing homeowners richer. Urging rising values for boomer homeowners is an unlikely rallying cry for a new generation of progressives.